We have all been there before… we request a blood test through our GP and on review of the results they inform us that everything seems to be “within range” and we are good to go. Well you are not alone. I see this regularly in clinic, where clients present to me with a condition and when they show me their blood test results they say “My doctor said everything was normal”. As a Naturopath we are taught to look much more closely at those results. Where are you exactly in the normal range? Are you on the lower end, smack bang in the middle or on the higher end? Where you sit in the range is very important information about how your body systems are functioning. It can give a clear insight to which direction treatment needs to go in order for you start healing and feeling better. This situation was a reality for a client of mine that presented to me late last year. My client is a 33 year old Male and he came to see me due to his inability to lose weight, despite eating healthily and kept very active exercising 5 to 6 days a week. 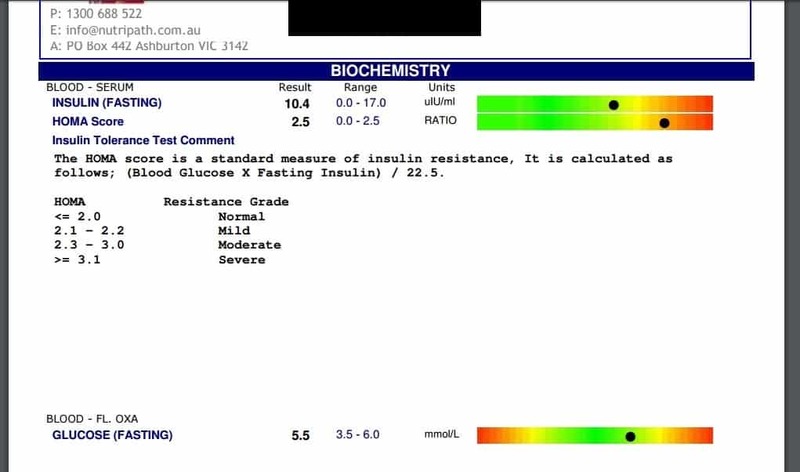 He mentioned that he thought he may be insulin resistance but said “ I went to a doc who said he didn’t believe in insulin resistance so that put me off and I never got the test done”. Now for starters, there is definitely such a thing as Insulin Resistance and it is supported by a substantial amount of research. Lets start at the beginning so we are all on the same page… Insulin is a hormone which is made by our Pancreas, an organ located behind the stomach. Insulin’s job is to enable our body to utilise glucose (sugar) from carbohydrates in food to either be used as energy or to be stored for later use. When someone is insulin resistant it means their cells are unable to effectively use insulin and cells cannot absorb glucose. This results in higher blood glucose levels, which can lead to Type 2 Diabetes. Has a strong family history of Type 2 Diabetes. Has lost 40 kgs at ages 17, 22 and 32. Only to put the weight back on. His energy levels were medium being a 5 out of 10. He wakes 1 to 2 times through the night. Feels very fatigued in the mornings. He did not feel he was stressed but thinks he mind can be busy at times. Digestive system appeared healthy and strong. Interestingly he did have a history or experimenting with gym supplements, in particular took a dose of testosterone boosting supplements and did not follow with oestrogen blockers. Let me stop there…when a male decides to take testosterone boosting supplements he will follow with an oestrogen blocking supplement, this oestrogen blocking supplement is to reduce the oestrogen and further increase testosterone. Whether I agree or disagree with this practice is not the purpose of this blog, so I am not going to comment on this. What I do want to show you is the interesting test results. Before I continue, I would like to point out that my client did raise the fact that he suspected he had hormonal imbalance, in particular a higher oestrogen level due to him not taking a blocker in the past. I sent him back to his GP to order some testing so he could get his testing bulk billed. 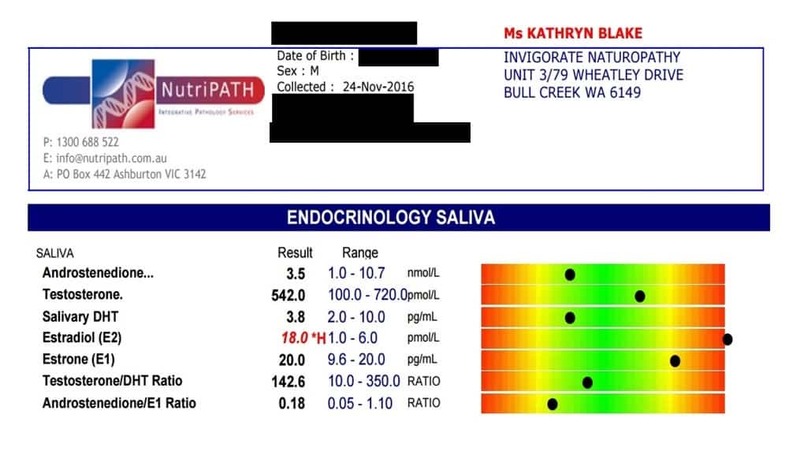 As you can see in the result, unfortunately Oestrogen was not tested at all despite my client requesting a full hormonal profile including Oestrogen. 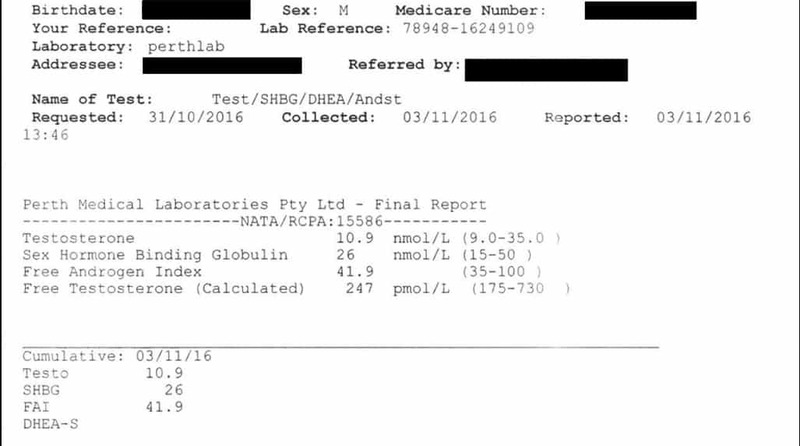 From a glance all these results look normal as they are all within the range, which is exactly what my client was told at his appointment. His testosterone is on the lower end of the scale, but I definitely wanted to see what his oestrogen levels were. We sent off for a salivary hormone profile. My client clearly has an excess of oestrogen. His Oestradiol (E2) should be between 1-6 and he was 18, and his Oestrone (E1) should be between 9.6-20 and he was at 20. I also requested him to have an insulin resistance test. His results showed he had a moderate Insulin Resistance Score and a high fasting blood glucose score of 5.5 (range 3.5-6). Needless to say my client was very surprised with his results and happy he finally had some answers to explain what was going on. We commenced his natural treatment plan immediately specifically targeting hormonal and blood sugar balancing. This is just one example of why you should be taking an interest and looking very closely at your test results. If you receive “normal” results and still feel unwell, it may be your turn to seek a more holistic approach to investigate further. This entry was posted in Health on January 28, 2017 by Kathryn Blake.